You may have noticed the signs posted in the front windows of Tryst, Local 16, Solly’s, or maybe even Hello Cupcake. But in case you didn’t , here’s the low down. 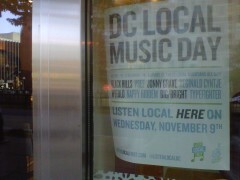 For the past four months, there’s been a monthly “DC Local Music Day” (FYI: It’s February 8 this month). What is DC Local Music Day? It is the day in which the aforementioned shops (and others) stream music created by local artists from open to close. This is all thanks to Listen Local First. If you haven’t heard of it yet, LLF is a new local music initiative in town. LLF is devoted to building awareness and creating opportunities for local musicians and venues in order to raise the profile of DC’s local music scene. All things considered, they’ve been doing a pretty good job so far. They’ve got a growing list of local business partnerships and show no sign of slowing down. LLF is the brain child of co-founders Chris Naoum and Rene Moffatt and their next goal for the project is bringing the DC music scene to SXSW this March. Want to get involved and support the Mobile Music Venue campaign? It’s easy. Visit the Listen Local First Kickstarter page to learn how.